The Landbridge module is an optional extension to the FreightDATA Intermodal application and is flexible with the way a carrier does their billing. Some of the flag setting are "Enter Chassis", "Multiple Dates" (on a single bill), "Driver Info Required" (allows pre-entry of containers and/or chassis without driver code), "Sort by Container" and "Revenue Distribution". Billing Entry allows up to 999 containers and/or chassis per invoice. The vessel name, driver pay amount, billing amount, container/chassis size, movement date(s), equipment type and direction of movement (i.e. : Eastbound, Westbound, etc.) are entered as invoice header information. Container and/or chassis numbers are entered in the invoice line items with associated driver. Depending on how the carrier has their Landbridge flags set, additional date may also be entered. If any accessorial/miscellaneous charges apply they may also be entered. These charges are selected from a "Miscellaneous Charge Master File" pre-determined by the carrier. The invoices remain in the "Landbridge Entry File" until the carrier selects it as complete and moves it into billing. 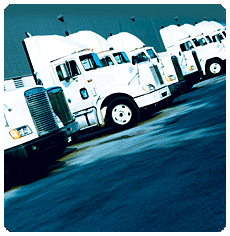 When the invoices are selected they are printed, A/R is posted and driver payment info is updated for later processing.